Last week the newest hair salon opened in Youngsville. 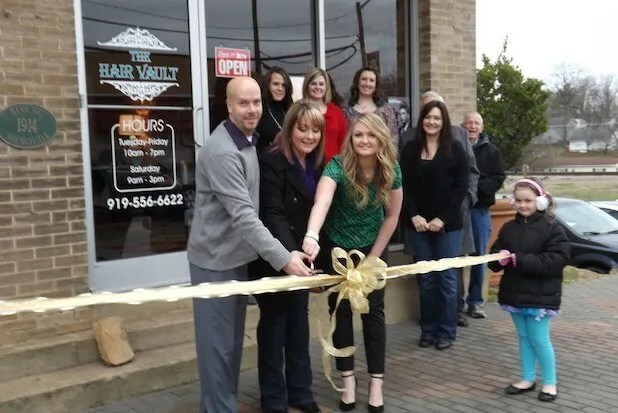 The new business is The Hair Vault and is located at 108 East Main Street in Youngsville. The grand opening looked like a fun filled event from the picture submitted. Mayor Flowers along with Jessica L Stapleton and the crew cut the ribbon with Town Board members Larry Wiggins and Graham Stallings joining them – Jessica’s daughter helped hold the ribbon! The Hair Vault can be reached at 919-556-6622 or at thehairvault@yahoo.com. This was the first time we were introduced to the name of the mayor of Youngsville and had to check on the correct spelling of his name. Apparently his parents did actually name him Fonzie Flowers. My God we love living in this area! In looking for more information from Fonzie we looked to the Town of Youngsville website where we found a most unusual message from the Mayor. It appears someone stole the message. We have alerted the Youngsville Police Department to issue a BOLO for it. We applaud The Hair Vault and Jessica Stapleton for the grand opening of her new business in beautiful downtown Youngsville and wish her the best of luck in the endeavor. I am the sister of the Mayor. I couldn’t be more proud. Our father’s name is Fonzie and the name has been in our family for generations. I am so glad you like it. Good things will happen in Youngsville!